Making a slideshow out of wedding or vacation photos is a great way to save those heartwarming memories for a lifetime. However, when it comes to choosing a slideshow software, it’s not always easy to figure out which program will suit your needs best. There are lots of slideshow apps on the internet and each of them offers different sets of options. To help you out, we have prepared this article where we will go through some of the most popular slideshow makers for Windows and Mac. We hope it will help you make the right choice and create your slideshow. Note, that the programs below are listed in no particular order of importance. 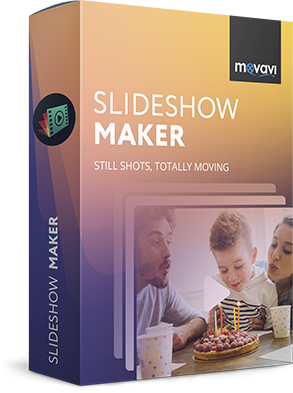 If you want to quickly create a slideshow without diving into complicated settings then Movavi Slideshow Maker is your perfect choice. It gives you an amazing opportunity to create an impressive slideshow just in 3 simple steps. Firstly, upload your favorite photos and videos to memorize them in a lifetime. Then use your imagination and creativity: add music and choose a transition style. The last step is to upload your self-made yet professional-looking slideshow to any social media and share it with your loved ones. Consider it as one of the best slideshow software for Windows and Mac. 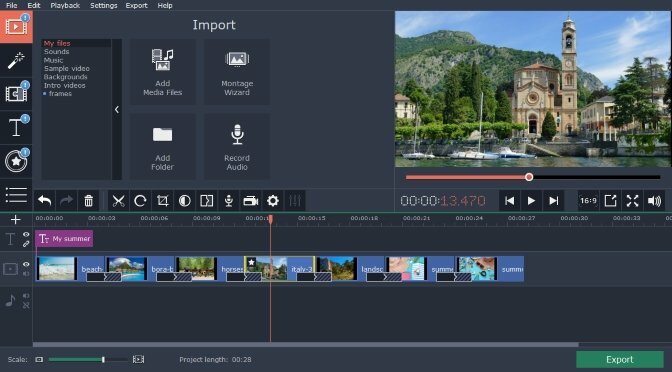 Movavi Slideshow Maker will help you master your moviemaking with no experience at all. This is another great tool which helps you create a slideshow for your loved ones. There are no usual timelines here. 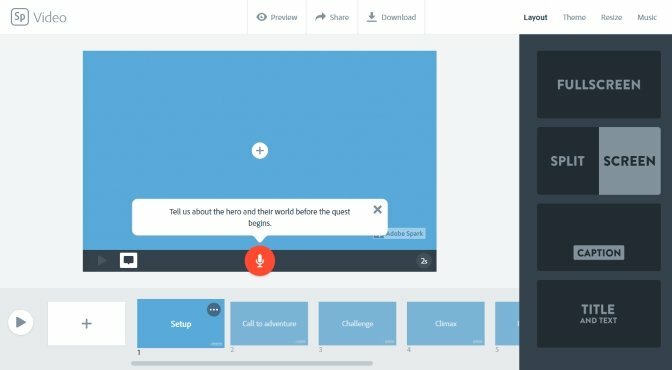 To start creating your own slideshow, you just need to select a storytelling template or create your own. Then add media to your slides, choose whatever you want whether it is an image, video, music or text, even theme or layout. End up working on your presentation by sharing it with your friends. PhotoStage Slideshow Software is an easy-to-use yet powerful tool. Mind it as one of the best presentation software for creating a slideshow in a short time. Make a presentation quickly choosing from your favorite photos. 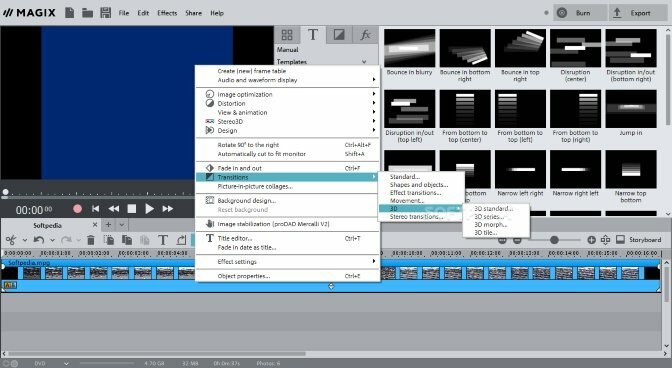 Enhance your slideshow using special editing tools and spice it up with a large number of stunning effects: captions, transitions, narration, and so on. Moreover, there are many other useful features, including saving your slideshow to video format and optimization for the portable devices and web. 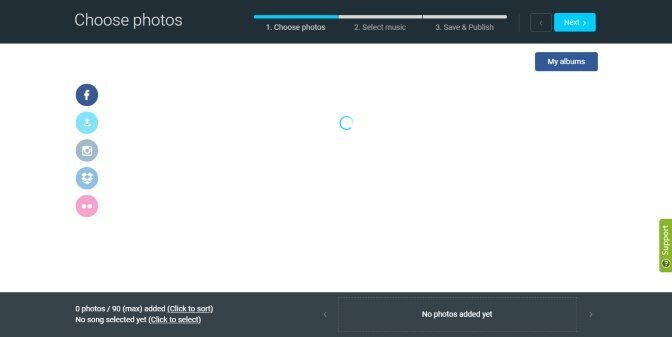 Photostory Deluxe gives you access to almost all features you need working on creating a slideshow, so it’s probably the best way to make a slideshow with your photos and videos. There are lots of effects, transitions, overlays, and filters which make your slideshow-making process as effective as it should be. If you need more than just photo enhancements and corrections, it’s worth considering this software as one of the best slideshow creators with photo collages. It provides professional tools to help you achieve the perfect look for your photos. It also offers the so-called “curves tool” for color brightness and values customization. Icecream Slideshow Maker has features that let you make your presentation much more driving and dynamic. However, pay your attention to other important factors such as usability, interface, and accessibility. 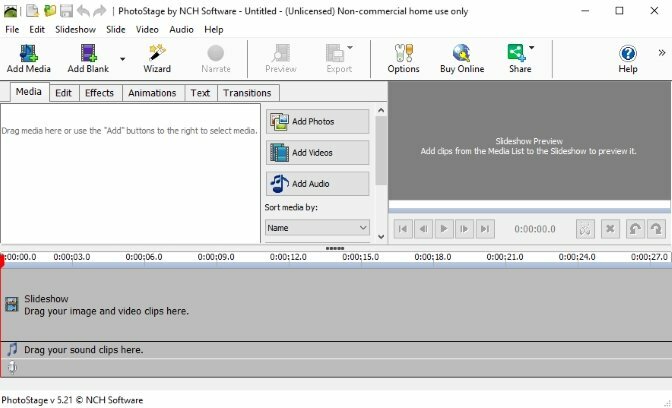 This slideshow maker software allows to attach multiple or single pieces of any media content from your computer such as images and music and has the easy-to-use tools for customizing your presentation. 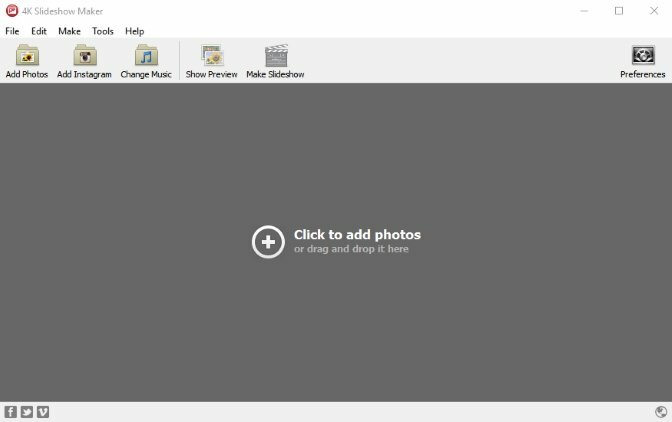 You can preview your photo slideshow before saving it as well. Slidely is a web-based visual content creation platform also supplied with mobile apps both for iOS and Android devices. What is more, it is free to use, but you can also purchase a premium version. This powerful web slideshow creator is a perfect choice if you don’t have much free time. The mobile app helps you create an impressive presentation no matter where you are. One more really helpful web-option is easy sharing of slideshows on almost every social media platform like YouTube, Instagram, or Facebook. This product makes slideshow-making process instant and easy for everyone. It allows you to make a video or photo slideshow with music just in a few clicks even with no experience. Use the automatic slideshow wizard or create it by yourself. There is a wide range of more than 900 built-in filters and effects, and hundreds of royalty-free music tracks. After finishing work on your slideshow, save it in one click choosing between more than 50 commonly used formats like Blu-ray, DVD and 4K and directly share on your social media. PicturesToExe is a professional photo slideshow software which you can use for creating slideshows with amazing effects like the great number of transitions and slide styles. 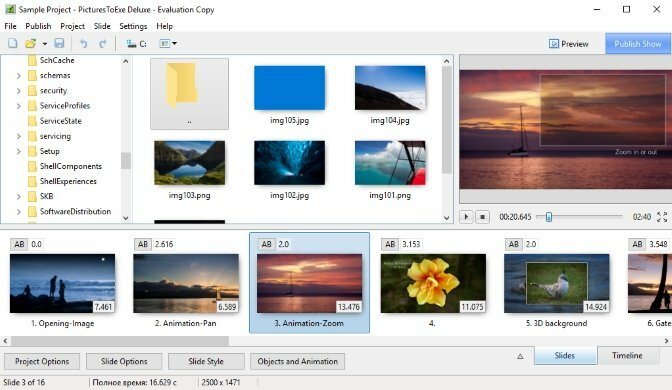 Consider PicturesToExe as one of the best photo slideshow software for mobile devices, because it has the app both Android and iOS. When your presentation is ready, save it even in Ultra HD. With PicturesToExe you can modify each slide of the presentation and add various animation and transition effects such as masks, 3D effects, dynamic blur, and smooth animations of the highest quality. SmartSHOW 3D is a really advanced slideshow maker that contains professional features and good usability. 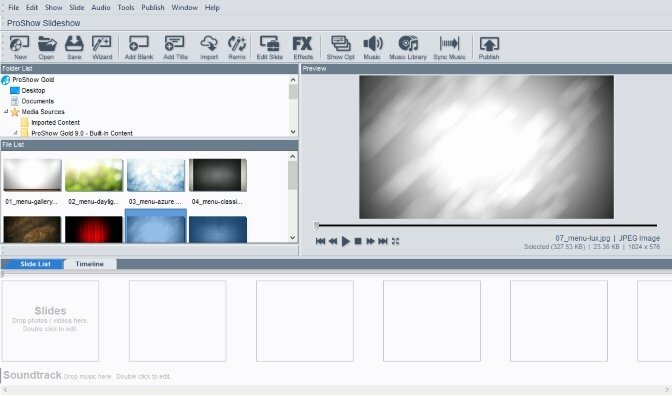 The software comes with extensive collections of animation effects, slide themes, transitions, and audio. It has plenty of opportunities for adjusting the slideshows and a large number of publishing options. SmartSHOW 3D has the standard version and the deluxe one with advanced functionality. 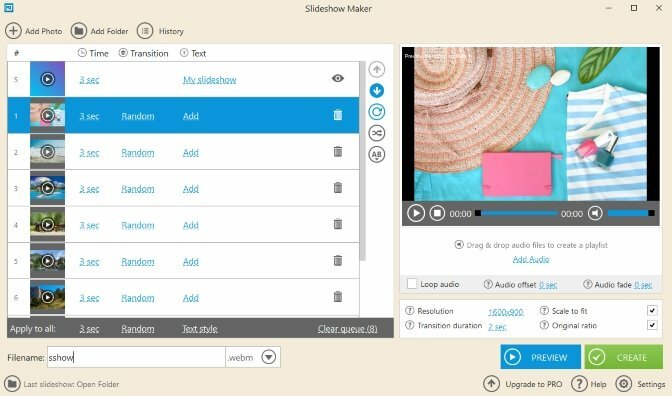 4K Slideshow Maker allows you to create slideshows with no experience at all. It has an instant import of photos directly from Instagram or from your PC, and stunning effects and transitions. This is probably one of the best slideshow software for Windows with a face-recognition feature, so you can be sure that you won't lose anyone in the group photo.